Conecake update! We are now making conecakes with layered cake and frosting. While I love actually baking in the cone, the cone can get too soft. 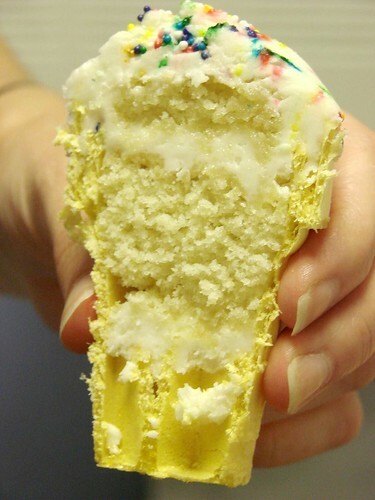 Now, I'm baking the cake separately and layering cake and frosting in the cone. That way, you also get more of an icing/cake combo throughout! Brilliant! Why hadn't anyone else thought out this? Blondie and I had to give this a try, of course. The cone was a little crunchier, but not super crunchy--then again, with this 188% humidity, it's hard for anything to stay crispy. I love the layering concept and the extra frosting hidden within. There are so many possibilites--mixing vanilla and chocolate cake. Hidding a candy or chocolate in the middle etc. As a decidedly pro concake-vist, I'm looking forward to seeing what Kim does with this new conecake technology. Keep informed of the truck's location by calling (212) 691-5226, checking their Twitter, or visiting treatstruck.com. 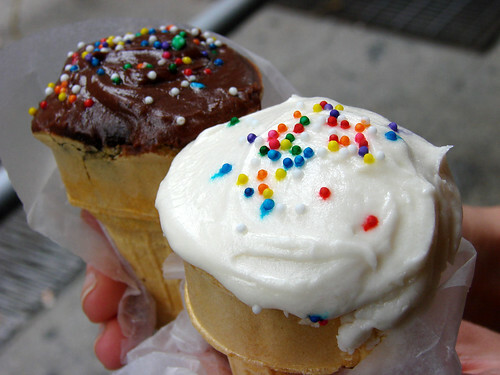 anytime i've ever had cupcake cones that friends made, they were terrible -- dry and gross. but i'll have to try these, since i'm a treats truck fan. Big Gay Ice Cream Truck is Packing Grape Nuts! Free Morning Pastry at the 'Bux! Katchkie Farm, Here We Come! Key Lime Pie and Swingles! Brooklyn Ice Cream Factory Hits Midtown!